Wash the lauki and peel off the outer skin. Boil water in a pot and put in the chopped lauki till it is soft. After it comes to a boil, add the cooked lauki. Let it cook sometime in milk then add sugar as per taste.Add chopped dryfruits. Sprinkle elaichi powder and take off from the heat. 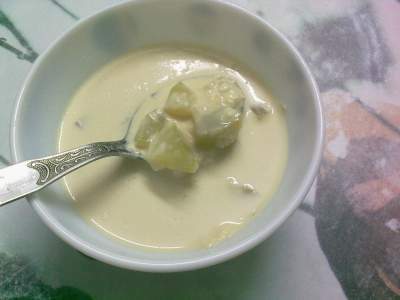 this lauki kheer really looks good...i always made lauki halwa but not lauki kheer...which type of lauki do u use for lauki kheer because for lauki halwa i prefer medium size lauki as small lauki halwa doesn't taste good. thanx Jaishree.I used a medium lauki for this..and make sure you use a fresh one.